3 new offensive linemen, Evan Mathis, and 2 rookies, Danny Watkins and Jason Kelce, that got a lot better as the season went on. Todd Herremans is a quality tackle and some say Jason Peters is the best in the game. They also had a new O-Line coach in Howard Mudd. The O-Line development led Shady McCoy to Honolulu after a tremendous season both rushing and receiving. A crazy season of DeSean Jackson antics and average play that will change next season. Jackson can be a great player again but he hurt this team. Brent Celek and Jeremy Mackiln are good solid players. Jason Avant and Riley Cooper are serviceable reserves. Injuries and turnovers to Michael Vick. You can’t help the injuries but Vick will protect the football much better next season. The Vince Young experiment didn’t work and it hurt this football team. There was a new QB coach in Doug Pederson. Overall I think this is a good, maybe great offensive football team if they don’t turn the ball over. Not many teams have these weapons!! The defensive line was pretty decent. Jason Babin was a Pro Bowler. Trent Cole is solid and the guys in the middle, Cullen Jenkins and Mike Patterson did a decent job but some depth is needed up front. Jaqua Parker might have run out of gas but showed spurts. The LB’s got better but need some major help. The Casey Mathews experiment didn’t work out, however he played much better later in the season. The jury’s still out whether he can be a full time player. I’d like to see them pick up a gap filler like London Fletcher a free agent from the Redskins and use the #15 pick in the draft on a LB, preferably Boston College’s Luke Kuechly. That would add some experience and toughness to the group that has to do a better job stopping the run. The DB’s were a mystery. Nnamdi Asomugha was pretty bad. He was pretty a guarantee to get burnt at least once a game for a TD. That won’t happen again this year. Every team in the league couldn’t have been wrong on the guy. Dominique Rodgers-Cromartie, Asanti Samuel, if he’s back, Nate Allen, Kurt Coleman, Jaquawn Jarrett, Josilio Hansen will be better next year. Again there were an awful lot of new faces on defense. Add to that a new Defensive Coordinator, Juan Castillo, new DL Coach, Jim Washburn, new LB Coach, Mike Caldwell, new CB Coach, Johnny Lynn, whose been replaced and new Safeties Coach Mike Zordich and not having any offseason practice time to get to know the new players and new coaches hurt this team badly especially early in the year. The Special Teams added a rookie kicker, Alex Henery and a rookie punter, Chaz Henry to go with solid long snapper Jon Dorenbos. I can’t say you can upgrade from David Akers but these guys did a nice job. 5th Winningest Active Coach. Bill Belichick (175 wins – 17 seasons), Mike Shanahan (157-25), Jeff Fisher (142-20), Tom Coughlin (142-16), Reid (126-13). Reid is 2nd among active coaches with 45 more wins than losses. Only Belichick is better with 78. Reid is tied for 1st among active coaches for years taking his teams to the playoffs with Belichick with 9. Remember Belichick has coached for 17 seasons to Reids 13. Reid has also coached the 2nd most playoff games and won the 2nd most playoff games to only Belichick. Reid has been to 5 NFC championship games and 1 Super Bowl as Head Coach of the Eagles. If Reid coached another 13 seasons with the same 126 wins, his 252 wins would rank him 3rd all time behind Don Shula and George Halas and 2 win ahead of Tom Landry. That’s pretty serious company. 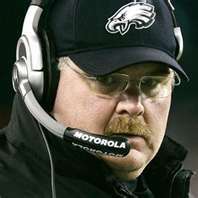 The only thing that is not on this Andy Reid resume is a Super Bowl Championship. The team is set up to make a run at the Super Bowl with the players they have and a possibly a few slight additions and there’s no one better than Andy to take them there.